Women always want to renew their image and style and to find new pats to express themselves and often this happens through the hairstyle. Here is where the medium hairstyles find their place. Those are the hairstyles with strands reaching the shoulders. They are a perfect option to the long hair when you need to cut and revive your damaged locks. 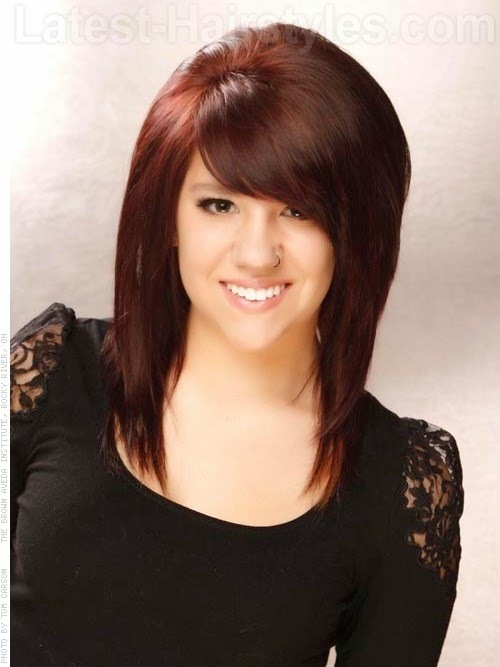 The medium hairstyles give you many great alternatives and abundance of different looks. There are many ways to style a gorgeous medium length hair whether straight, waved or curly, with body and flexibility. The straight hairstyles need texture. For more creative look, cut the tips uneven and dry them in the direction of the face. This is an easy hair styling technique that will to accentuate the layers. The curly locks should be kept in layers to add more definition to the mane. There are plenty of tricks to change the way your hairstyle looks. One is adding an attractive color. That can change the way your mane reflexes the light and if the shade suits you will revive your complexion. With a couple styling techniques you can reshape the medium length hair in a variety of styles. You can make a breezy sculpted look, with layered upper section and sides. This is a fantastic, youthful looking and easy to maintain hairstyle for medium length locks. Apply a fixative hair product and then, with a small round brush, start to blow-dry with a hair dryer beginning from the top of the head, going back and down. Once dry, apply hair styling product to the entire length of the hair to separate the strands from each other. For a medium-long elegant hairstyle, apply hair mousse to dry locks and using a round brush begin to blow-dry the lowest layers, going gradually upwards, finish with the top layer. When you are done, apply hair gloss and hair spray to fix the hair. For locks with medium texture, to create a modern and trendy hairstyle and relaxed look, apply hair mousse to damp hair, then dry with a hair dryer starting with the sides and then from the inside out. Continue with the rest of the mane, ending with the tips. End with some hair wax and a bit of hair spray lacquer to give fixation. You have to remember that the beautiful hairstyle needs healthy and beautiful hair. This is not a result of one day intensive care, but it comes with the consistent everyday care.